Tax preparation doesn’t have to be taxing, yet it is a task that people often seem to want to avoid or put off until the last minute. Although your tax information may have changed significantly since last year, it isn’t as difficult to organize your financial information as you may think. In this post, we’ll introduce you to our free downloadable tax prep guide. How Has Your Life Changed this Year? Life changes such as adopting a child, getting a divorce, or receiving social security or unemployment can make a big impact on your taxes. Charitable contributions, health insurance, and childcare costs can lead to possible tax deductions. Your retirement contributions, military service, and home ownership status can also affect your taxes. In short, without the proper framework, you might be overlooking certain life changes that could impact your tax return. Our free tax preparation checklist makes it easy to get an overview of your finances and any changes that have occurred that may affect your taxes. Simply answer the questions in the document to get organized and discover which documents you’ll need to gather prior to filing your taxes. 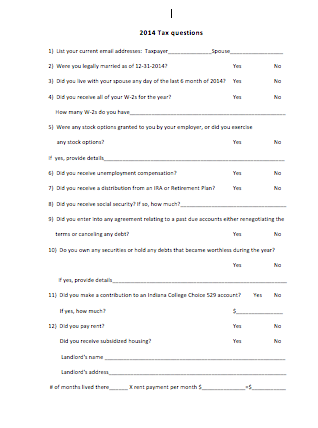 If you need some assistance organizing your financial records prior to filing your taxes, click here to download free checklist. Baker Retirement and Wealth Management, P.C. has been serving the greater Evansville area (Jasper, Newburgh, Henderson, Boonville, Mount Vernon, Owensboro, and beyond) with guidance regarding tax laws, small business accounting, family farm inheritance tax strategy, and more for nearly thirty years. For assistance with filing taxes, call Baker Retirement and Wealth Management today at 1-866-244-3517. Tax Preparation Time is Here!